Port Charlotte Scottish Barley (50.0%): This week with all other whisky lovers in the world we are celebrating a life dedicated to Scotch whisky. 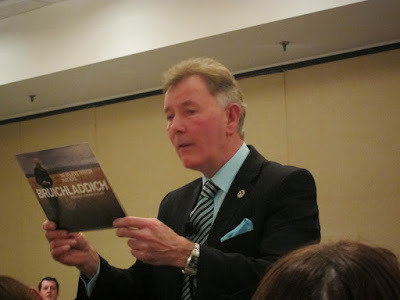 Jim McEwan announced a few weeks ago that he will be retiring after this year's Feis Ile following 52 glorious years in the industry. I met him first in person briefly on a gorgeous November day in Bruichladdich distillery back in 2009. Then I was fortunate enough to attend quite a few of his tastings both in New York and Massachusetts where every single time he proved that he was the true rock star of whisky making. Just a couple months ago I watched him absolutely shining at Julio's Go! Whisk(e)y Weekend dinner where he hypnotized a roomful of people for four hours straight. I would love to taste one of his creations tonight to honor this grand master. 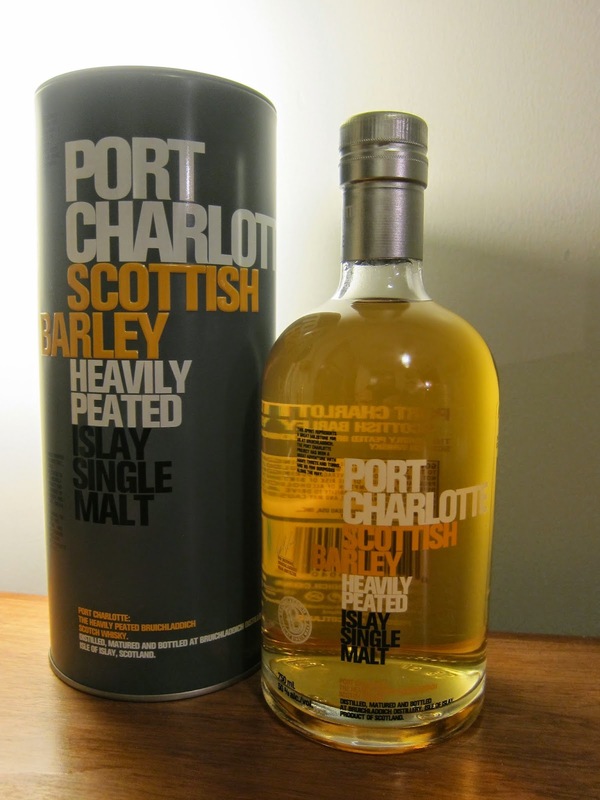 Port Charlotte Scottish Barley it is... I wish I could step on the table now and do the Highland toast with you screaming my lungs out Jim..! Color: Yellow gold with nice visible legs. Nose: Haystack, freshly squeezed lime juice - actually more like a key lime pie. Dry soot and graphite. More medicinal than peaty: Hydrogen peroxide soaked gauze pads and band aids. Dry hay smell amplifies in time: Now it feels like walking into a stable or barn. Wet and damp barley, just before they got shoveled down to the kiln. I can spend easily another hour nosing this dram... Water adds latex gloves and rubber bands. Palate: Hot and peppery first. Salted butter, crunchy peated dry malt and white peppercorns. Dry grass, butter scotch and toffee. Water brings a creamy and doughy mouthfeel. Oatmeal cookies, green banana peppers, charcoal and Meyer lemons. Finish: Forever long and tongue tingling. Barbecue ash, black pepper and grilled bananas. Overall: This is a great Port Charlotte... Young, punchy but creamy and smooth. Absolutely loved the pronounced malt notes. If you visited any distillery with floor maltings you will immediately recall the smell of malting floors and the taste of dried barley right after it gets out of the kiln. Just imagine those qualities, amplify and concentrate them and then forced into a bottle. Gorgeous release... Have a great long life with your grand children Jim..! Slainte..!